Recently, I wrote philosophically about Learning to Dance with Both Life and Death. I shift now to navigating the practicalities of dying in Italy. Dreams of living in Italy often include a vision of riding out one’s years here and drawing one’s last breaths in the country they’ve come to call home. If that is your dream, and a possible reality, then I recommend knowing the lay of the land. Dying in Italy can come with complications if you’re not prepared. You don’t want to be caught unawares if you or your significant other dies while living in Italy. 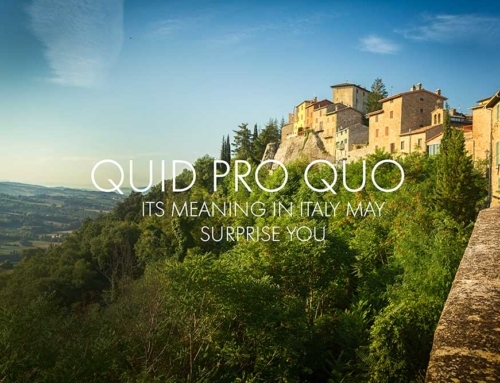 I suspect many people will read this post and exclaim “What a downer!” But I’ve promised to be faithful to addressing the full gamut of what life in Italy entails, and that includes the potential hurdles that can come with dying in Italy. Having a relationship with a local attorney can be advantageous. He or she can help you navigate the laws and bureaucracy if you or the person who ends up being responsible for funeral and burial arrangements hit a snag. In my opinion, there’s no better person than one who knows how to navigate the often sticky Italian red tape rather than trying to figure it out on your own. And you can’t always rely on the local undertaker to just handle everything, especially if you’re out in a rural area with an undertaker who is “light” on facilities (such as being able to “hold” the deceased while making final arrangements). For people who move here permanently, dying in Italy is a very real eventuality. Recently, a dear friend living in Umbria lost his spouse of over forty years. When cremation arrangements were sought with the local undertaker, he ran into a problem with the local comune, which claimed their documents from the UK (both were British citizens) were missing a stamp from the Italian Consulate in England. The comune would not authorize a cremation. Two days of back-and-forth forced a solution to transport the deceased to a facility in Switzerland where cremations are performed more easily. That meant more than twice the cost of a local cremation. Imagine the angst trying to navigate this situation while in the immediate wake of death. Why would the comune put the kibosh on a local cremation when my friend had all the necessary and correct UK documents, which should be valid throughout the EU? Why had another good friend (also from the UK) been able to arrange two cremations in Umbria without complications? I simply don’t know. But one thing you’ll learn when you live in Italy is that you can go to the same office and speak to a different person and get a different answer on any given day. Dying in Italy usually results in burial, one that usually happens in short order. For most U.S. citizens, they’re familiar with the predominance of Protestantism and cremations are a pretty frequent occurrence. According to CNN in 2016 over 50% of Americans chose cremation. Come to Italy, a country predominately Catholic, and you’ll find yourself in an environment where burial is the norm. While cremations are on the rise in Italy, they certainly don’t happen frequently. Embalming also isn’t as readily available nor is it usually employed. Often a funeral and burial happen within a couple of days. Burial is an interesting affair. Since this is a country in which most people are buried, cemetery space is running short. In fact, in most cemeteries, you lease a space. It may be fifty years (sometimes renewable), it may be twelve–- as in the case for most burials on the Isle of San Michele, Venice. Read this fascinating The New York Times story to get further details. “After about 12 years, most remains are exhumed and either cremated or deposited in an ossuary on the mainland.” “Venice’s Isle of the Dead” by Susan Allen Toth. Again, it’s best to understand these things ahead of time so that you or your surviving spouse or friends can act accordingly. Within seven days, the local comune must be notified at the Ufficio di Stato Civile. The undertaker usually handles this. When a death occurs at home the guarda medica should be called immediately. Dying in Italy may be a person’s wish, but they may want to be shipped “back home” to be laid to rest with other loved ones. If that’s the case, you’ll want to have that spelled out, and you’ll definitely need to work with your consulate to pave the way for either the body or the ashes to be transported to the intended destination. Depending on whether shipping and/or repatriation arrangements are involved, and depending on whether you’re prepared for other matters, funeral arrangements can be inexpensive or expensive. Consider the situation shared above and how my friend ended up paying more than double. This is why I urge new expats to Italy to have a plan detailed and all the necessary documentation checked and double checked to ensure there will be no hiccups. And, I advise setting aside funds in advance to cover the costs. Joint accounts get blocked, and other funds may have to wait for probate. My friend’s recent death experience has prompted me to start getting my affairs in order in this regard so that my other half (100% Italian) isn’t left with an uphill battle to carry out my wishes. Our documents are on record with the comune and our wills and power of attorney are complete. Discussing the matters pertaining to death can be a bit of challenge since Italians, as a general rule, can be incredibly superstitious and don’t want to talk about death. They fear that by doing so it invites death to one’s door. I’d hate to stick my head in the sand about all this and then leave a mess, so we’re having the necessary conversations, all while I remain firmly dedicated to hanging out on this earth in beautiful Italy until I’m well into my nineties. Loads of runway there, I hope! Thank you very much for your valuable information. Very important to know. My wife and I are moving to Italy next month. Many of these “inconveniences or red tape” are similar or equal to where I was born, Colombia. one must consider and know when you move to Bella Italia. Hi, Edgard! I’m glad you’ve found some useful information here. Forewarned is fore-armed, in my opinion, and I try to help people get a sense of what they will encounter. Congratulations on your impending move. Italy has been a wonderful home for me and I hope the same will be true for you! Thank you, Jed! Once again, such a GENEROUS reply. Thank you for your thoughtful response. I value your feedback highly. Hi Jed. Thank you for another great topic. Do you have suggestions about how to go about identifying financial advisors and attorneys before actually moving there? My son and I have received our Italian Citizenship recognition and are flirting with a move but we would like formal advice before proceeding. We are not clear what part of the country we may ultimately settle (if at all) depending on the information we receive. Our questions include issues like earning money in Italy and tax ramifications to Italy and U.S., are U.S. Social Security benefits lost if you permanently reside in an EU country? I’m assuming we need to find an attorney and financial advisor in Italy as well as in the U.S. Should I contact the Italian Consulate in the U.S. for advice? A lot to ask of you. If too much, please feel free to say “basta!” I love your photography. Thanks for all that you do for us. BTW, I’ve engaged with the Italy Made Easy Academy and I love it! If not for you, I might never have found Manu Vendetti! Thanks again. Hi Angela. Thanks for writing. I avoid giving anything other than general “directional” advice when it comes to finances. A tax expert in both the States and one in Italy will be important. I’d suggest interviewing and choosing a U.S. accountant who is adept at helping you file as a foreign resident (if you don’t already have one you might want to do an information interview with someone from greenbacktaxservices.com) and make sure Uncle Sam is being satisfied. Then, I’d network in the area in Italy in which you intend to reside and get word-of-mouth recommendations for someone local. A solid, local commercialista will advise you regarding your Italian taxes (including the IVAFE annual tax which was enacted a few years ago and it is for all Italian residents, citizens and residents, for your foreign held “property” which includes equities, bonds, etc.). I’d get a recommendation from someone Italian, who can vouch for the commercialista’s qualifications. As for social security, unless something dramatic has occurred of which I’m not aware, your being a permanent resident in the EU doesn’t affect your ability or right to draw social security. I know plenty of people who have lived in Italy for years and continue to draw their social security benefits. As for an attorney, again ask for references and find someone who has a solid command of English. Notaries function at a much higher level in Italy than the position of the same name in the U.S. In many cases, they handle legal matters that you would think only would be performed by an attorney. Make your inquiries with a list in hand of all the potential legal issues for which you want to have a plan, and they can tell you what you need to do. Regarding the Italian Consulate, I don’t believe they will be an ideal source for identifying financial advisors or attorneys. I think they prefer to stick to visas, citizenship, and other immigration issues. If you find a consulate willing to hand out these kinds of recommendations, let me know. I’m so glad you found Manu! He’s a gem. Fascinating! I am sorry for your friend who had to go to such lengths to cremate his spouse, but I am glad you learned from it and shared your knowledge with us. Learning the ropes in Italy involves loads of things. I’m grateful life experiences are helping to guide me! Thanks for this important piece. People everywhere should prepare in advance, but it is particularly important for those who live abroad, for all the reasons you mention — and particularly in a country known for red tape. There is no need, nor should there ever be, to apologize for broaching a topic that some will shy away from. Death is a part of life, though many Westerners are overly shielded from it — at least until it touches them directly. Your readers appreciate your frankness and in fact count on it. Thank for your comments of support on this very important topic, and thank you for encouraging me to not shrink from discussing matters like this! Hi Jed. Thank you for this. Do you have an attorney you recommend in Umbria? I think this is all very wise counsel. Your post is an important one, Jed. And, it reminds me of all it took to get my husband’s body back on US soil after he died unexpectedly while we were on vacation on St. Martin. What a time that was! Thank goodness we had discussed our “death wishes” with each other previously. It was a conversation I resisted but having it made everything easier once we landed. On a lighter note, I hear you designed the cover for Kat’s latest book. Love it! Thanks, Joyce! I so appreciate your helping to remind people to not put off this subject simply because can make a person uncomfortable! I’m so pleased you like the cover I designed for Kat’s new book. I’m working on a cover illustration for my first novel. Who knows if it will see the light of day, but you never know! Enjoy reading your articles, no matter what the topic! My husband and I bought a small apartment in Rovereto (TN) a couple of years ago. We go back and forth to Rovereto from the U.S. I live in Italy 3-4 months a year. I’ve wondered about inheritance laws when we die. It’s on my list to check on! Thanks, Chip, for weighing on on the importance on not putting this off, no matter where a person lives. We all make that journey, and who knows who is on the short plan or long plan!